In this post our Central Bali day trip contitues. We are returning from Mount Batur to Sanur. First we visit a coffee plantation and learn about Luwak coffee which is said to be the most expensive coffee in the world. Then we will visit the holy Pura Tirta Empul temple and walk on the postcard-pretty rice terraces of Tegallalang. Before heading back to the coast we watch how local Bali people spend their Saturday night. This is the return journey through Central Bali. If you want to read about the sights we saw on the way up to the volcano, read my previous blog post Day Trip to Central Bali. This is Mount Batur. It’s a volcano, 1717 m high. It erupted in 1917 and it was a huge eruption. Many villages were destroyed and people killed. Many locals we talked to told their grandparents have seen the big the eruption. There was another smaller eruption in 2000 and after that it’s been quiet. When we visited Bali August 2015 there was a long-lasting eruption of another volcano on another island Jawa only 150 km from Denpasar Bali airport. The ash cloud caused severe flight problems and lots of flights to Bali were cancelled during several months. I was so worried about our flights that I tried to cancel our flights which was not possible. We were on the way to Europe from Australia and simply had to get back to work. But we had good luck. The winds were blowing the ash to the opposite direction and not towards Bali. No ash in the air, clear skies and lots of sunshine during our stay – on the coast. In Central Bali clouds were gathering around the mountains on afternoons even when it was the dry season. 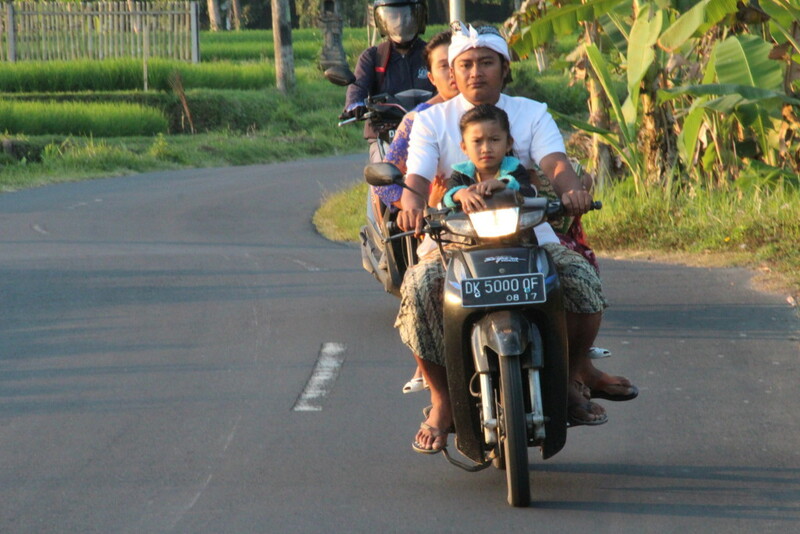 Bali local people drive this way, so seat belts or safety seats for kids. Or they use motor bikes, the whole family is sitting on the same bike.Every school child from around 15 has a motor bike and there is a rush hour when the school ends. There are much more bikes than cars in Bali, bu why not, they are practical on the narrow roads in this climate. On the way down from the volcano we passed coffee and fruit plantations. In the high altitudes coffee is grown and so is tea, potatoes, fruit trees and vegetables. We stopped at one of the coffee plantations, Satria Agrowisata. To begin with we walked through a large well-maintained garden for all kinds tropical plants. It was almost like a botanical garden. Our driver explained what all the plants were and how they are used. In this picture you can see the plantation entrance in case you want to visit the same place. We watched how coffee was roasted and tried roasting which was fun. The beans are collected, then roasted and crossed. A very simple process. There was a display of different sorts of teas, coffees and spices. We saw cages where luwaks, or they are called civet cats in English, live. These civet cats help produce the world famous Luwak coffee. Civet cats eat coffee beanc and later poop them out and then they are washed and roasted. Civet cats always eat the coffee beans as whole so they are not digested. At the end of the walk we reached huts where we tasted samples of different coffees and teas. The girl that was guiding us was very professional and informative so we learned a lot on coffee plantations. And it was nice to sit here and taste different Balinese coffees – and look at the pretty views to the coffee plantation. The plantation was on the opposite side, it was a terraced mountain slope with coffee bushes and walking paths between them. Farm workers were collecting beans and carrying old-fashioned baskets on their heads. At the end the girl led us to their shop where we bought coffee to bring home. The coffee was a lot more expensive than in local shops but we thought it was a good idea to buy some since we had seen how the coffee is produced. This is the website of Satria Agrowisata coffee plantation. There you can find the exact location. Pura Tirta Empul is a holy water temple located in the village of Manukaya. Tirta Empul was the next stop of our Central Bali day trip and it is a national heritage site. The temple has a bathing structure with fresh spring water where Hindus go for purification. Bali is a 95 per cent Hindu area and if I understood right this is the only temple for washing so everybody wants to visit the Tirta Empul Temple at least once in a lifetime. Other religions in Bali are Buddha and Islam. All other parts of Indonesia are Islamic. Our driver told that different religions live side by side and tolerance is not a problem. In addition to washing offering is an important reason for Hindus to visit Tirta Empul. There was a constant flow of people to the offering area. Pura Tirta Empul has more ponds. They all get their water from the natural spring. The temple was built in the year 960. The buildings and the ponds together make an amazing view that you don’t see in many places. It’s really worth stopping at this place if you’re touring central Bali. All visitors must wear a sari that you can rent at the gate. Here is more about the history and background of the Pura Tirta Empul temple. Tegallalang village north of Ubud was the next stop on our Central Bali day trip. Tegallalang is known for its beautiful rice terraces. The village looks to a valley that consists of rice terraces climbing up the hills all the way on both sides. Tegalalang village has shops, restaurants and souvenir stores so you could have a lunch or coffee here while watching the views, but the main thing is to take a closer look at the rice paddies. We saw some farm workers. The rice fields are full of water and the workers have to stand in it. And they have to climb a lot and walk on slippery paths. Rice is planted and harvested three times a year and it’s first grown in dedicated areas until it is planted in the deep terrace waters. Here is another view of the village from where you start walking down long stone stairs to the valley after which you can climb to the other side. As expected we were not the only tourists in this pretty place in Central Bali. Reserve time for Tegallalang and take good walking shoes. You’ll get splendid photos of the terraces if it’s a sunny day. My pictures are a bit dark. Behind this link you can find more and better photos on Tegallalang Rice Terraces. As we left the rice terraces the sun came out. It was Saturday night and there was lots of traffic on the country road. Sunday is a holiday in Bali and on Saturday people are working and the children at school. But where are all these people going? We stopped the car to take photos of rice fields and the small statues that appeared to be temples of the rice god. Then we came to a temple and found out that that was the place they all were hurrying to. So they all went to a temple where an orchestra was playing, it was mostly young boys. It was all so pretty and the music was so much typical to Bali that we stayed for a long time behind the gate and enjoyed the feeling. What a beautiful country Bali is and how I love their happiness and their music! This concludes our Central Bali day trip. Time to get back to our tourist resort and for a hotel dinner… This was a very good driving day!